Clarissa and I did a preschool curriculum together last school year. She really liked it in the beginning and then started to lose interest in April so we stopped. By May she was asking to do “real school” at home so I planned a June start to kindergarten. I spent hours looking through all of my school supplies and the activities that I had downloaded. I tried a homeschool planning course to see if that would help me. But I think that stressed me out more because it encouraged me to plan for the entire year before I start the school year. I decided to plan unit studies since I don’t have a formal curriculum to just break down into sections. I did make an outline of what units I thought we would do this year, but I knew it could change because I wasn’t sure how much Clarissa would enjoy doing each day. I wanted to start slow and get into a habit of doing lessons 20-30 minutes per day just four times per week. Our June Bible story was about Joseph (his coat, his brothers, and his life in Egypt). We read some of the Bible story each day and did a few crafts. We spent some time learning about our five senses, colors, shapes, and emotions. She also learned how to make a peanut butter sandwich and a peanut butter waffle. Some days Clarissa would enjoy school so much that she wanted to do more so we would do two or three days worth of lessons in one day and then she wouldn’t want to do school for a few days. The weather was so nice that we would often do school outside. In July, we started doing more academics, adding letters and numbers to our days. We went to Japan in July so we spent some time watching videos and reading books about Japan. We also learned about the letter J; it’s sound and how to write it. I wanted to spend the month memorizing Jeremiah 29:11 instead of focusing on a Bible story, but Clarissa kept asking for Bible stories anyway so we did both. I knew that one of our next family adventures would be to the aquarium so we started studying sea animals when we returned from Japan. We learned about the letter C and Clarissa practiced writing her first name. She can already count past 10 but we focused on writing just those numbers and counting things or playing board games that require counting dice and spaces. By mid July, Tim thought that I was spending way too much time planning our activities. He suggested that I buy some curriculum instead of making my own in order to make the planning of school less stressful. I agreed that although I enjoy planning, I was spending too much time “trying to do it right.” I was also printing so much that we were spending plenty on ink. So I went online and ordered some kindergarten books. In August, Clarissa learned how to make her bed. Since it was been so hot outside in Korea, her new favorite place to do school was actually on her bed. We spent two weeks reviewing a literature study on Paddington Bear that was excellent. We then went back to studying ocean animals, worked on counting and writing numbers to 20, and learned the sounds and letters P, B, F, and S. We focused on Bible stories about fish; Jonah, Jesus calms the storm, and feeding the 5,000. For her birthday we went to an aquarium in Seoul and she really enjoyed looking at all of the animals and feeding the fish. At the aquarium, Clarissa and Tim got really excited about the kits to grow triops and angel fairy shrimp, so we have a few new pets at our house. We learned about life cycles too. September was less stressful. The weather was cooler so we read and explored outside again. I also have a reading curriculum, math workbooks, and some unit studies that we both enjoy so I don’t have to do as much prep. We also read a lot of books. When we studied Noah’s Ark we spent a couple of weeks reading about animals. After a walk last weekend, she is all about bugs. I am so thankful for the library these days! Clarissa is also enjoying attending AWANA, a Korean class, and gymnastics one hour each per week to round out our lessons. When I was a teacher, my students often used Starfall Education Foundation. Clarissa has enjoyed playing the free version of the Starfall App on her tablet for over a year so I was very excited when we were chosen to review the The Starfall Home Membership. Thirty five dollars will give you a year of access to all of the additional content on multiple devices for a full year. I can access my account on multiple devices so I can look at Starfall on my laptop, or Clarissa can play it on her tablet. Clarissa enjoys using the Starfall app on her tablet. She gladly plays for thirty minutes at least three days per week. I didn’t have to worry about her finding anything inappropriate in the app. She can explore and learn math concepts or work on reading skills. She seems to really enjoy the math games. She has learned about symmetry, weight, and comparison of sizes. I was surprised that she actually understood those concepts after the lessons and games. I really liked the way Starfall explained place value. I think Clarissa actually understood the difference between tens and ones. There are several different levels of reading activities as well. Clarissa can choose books of different genres. I can read them to her or she can press a button that looks like an ear and the words will light up as the app reads the story to her. There are games to practice letter recognition as well as phonics lessons for individual sounds. She got used to repeating the sound after the app, so she now often repeats everything she hears because she thinks she is reading. Clarissa enjoys playing the games, but sometimes wishes they are more customizable. For example, there is a calendar game. She learns days of week and how to read a calendar. She then gets to choose clothes to get dressed and go outside to play during the game. Because it is winter, her only choices are the current month and winter clothes. Clarissa often asks me to “switch it to summer.” But there isn’t an option to do that since it is currently winter. I like that I can access Starfall on my computer or her tablet. The frustrating part for me is that there doesn’t seem to be any method to accomplish skills in order. There also isn’t a record of any kind. I don’t know which games or skills she has studied unless I watch her play. For example, if you go to the mouse picture, learn to read, there are 15 phonics lessons. However, it does not check them off or move you on to the next level when a lesson is completed. If you plan to really sit next to your child and tell them which things to do, then maybe that won’t bother you. 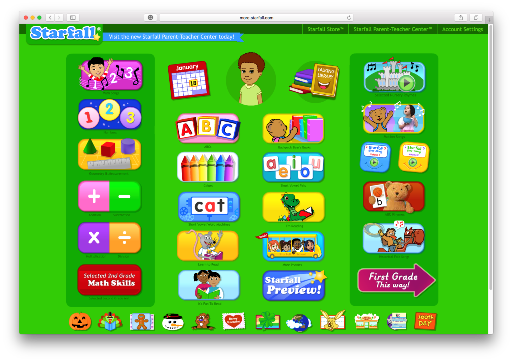 My other frustration is that Starfall Education Foundation only works with an internet connection. At home in the living room is fine, but if I want Clarissa to work on Starfall on a train or at a restaurant, I have to set up a wifi hotspot on my phone in order for it work on her tablet. Clarissa is excited to have some tablet time to use Starfall Education Foundation. At $35 per year, I think that the The Starfall Home Membership is a worthwhile investment for preschool and kindergarten learning. There are even more advanced lessons for first and second graders. Multiple children can use Starfall as well, but they would share the same profile. There is also Parent-Teacher Center that shows a full printable curriculum to use for both preschool and kindergarten. It looks to be made for a classroom setting, but you could also follow the curriculum to use for homeschool if you wanted to. There are plenty of worksheets available as well.